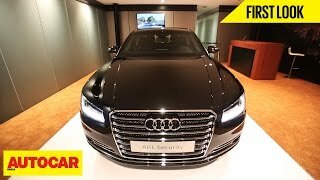 Audi has launched the high-security version in the A8 car line, the most exclusive model, the A8 L Security which meets the class VR7 ballistic protection standard. 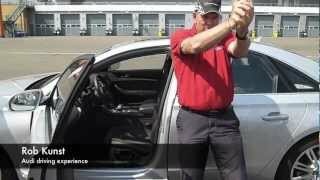 The 2015 Audi A8 L Security is 5.27 meters (17.29 ft) long and has a 3.12 meter (10.24 ft) wheelbase. LED headlights are part of the standard specification in conjunction with the V8 engine; the W12 comes with Audi’s innovative Matrix LED technology. 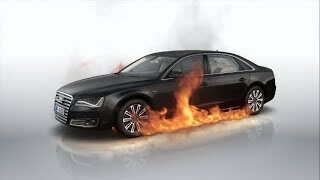 The new Audi A8 L Security has been officially certified by the German Ballistics Testing Center in Munich; it complies with the requirements of the class VR 7 ballistic protection standard in accordance with the BRV (Bullet Resistant Vehicles) 2009 guideline. In certain areas, the armor plating on the A8 L Security even complies with the criteria for the classes VR 9 and VR 10. Some optional safety-related equipments are available which include the emergency exit system, a fire extinguisher system and the emergency fresh-air system. Numerous additional solutions round out the offering. 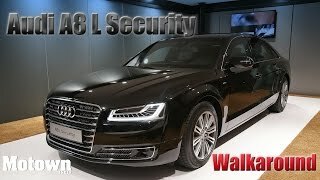 The Audi A8 L Security will be available with a V8 4.0-liter TFSI engine producing 435 HP (320 kW) and 600 Nm (442 lb-ft). With this power the armored sedan will accelerate from 0-62 mph (100 km/h) in 7.5 seconds. The fuel consumption stands at 10.9 liters / 100 km (21.5 mpg US or 25.8 mpg UK). Audi is also offering a larger W12 FSI naturally-aspirated engine developing 368 kW (500 hp) and 625 Nm of torque (460.98 lb-ft), enough to propel the large high-security sedan from 0-62 mph (100 km/h) in 7.1 seconds with an electronically limited top speed of 130 mph (210 km/h). The W12 averages 13.5 liters of fuel per 100 kilometers (17.42 US mpg). Orders can already be placed for the 2015 Audi A8 L Security, with deliveries starting in the third quarter of 2014.